If ramen is what you're after, look no further than this new mobile eatery. Called 213 Ramen, the newcomer is often stationed at Field of Dream.me at 1787 Westwood Blvd, Los Angeles, and Contra - Los Angeles at 1927 W 6th St, Los Angeles. The street food vendor fuses California flavors with classic Asian cuisine, for a fresh take on the popular Japanese dish. 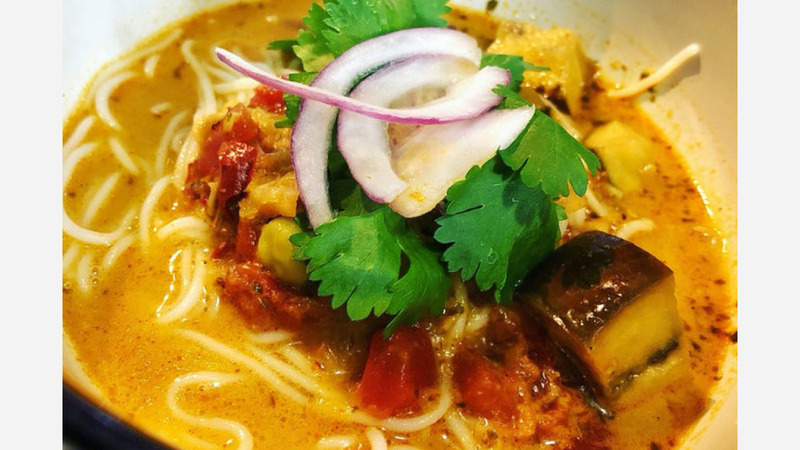 Offerings include bowls like vegan Mexican coconut curry with eggplant and green garbanzo beans; chile lime beef with adobo broth; and green chile made with hominy, tomatoes and jalapeno chamoy chicken. Keep up with 213 Ramen by visiting it onFacebook and Instagram. With just one review on Yelp thus far, the mobile joint currently has a five-star rating. Peter S., who reviewed it on May 23, said, "Bomb.com ramen! Broth is out of this world! $5? You couldn't find a better bowl for twice that. Andres and Courtney are great young men -- support this local business!" Follow the business on social media for more details on hours and location.